2019 is set to be a historic season with the all new Whakapapa Gondola opening in June. 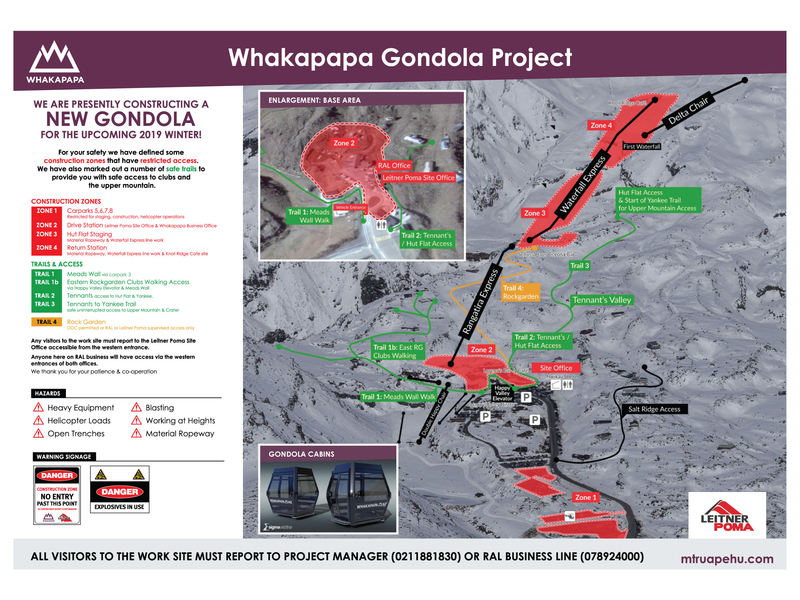 Whakapapa is a construction zone with restricted access for the duration of summer 2018/19 until the opening of the gondola this June. Please refer to this access map for details of construction zones and safe access trails to clubs and the upper mountain. Note: Happy Valley Elevator is not operational. Access to Meads Wall via carpark 3. Here's another video update from Steve at the Sky Waka return station. A video update from General Manager Jono Dean from the Whakapapa Sky Waka gondola construction site. The return station is taking shape! Here is some exciting visual progress from 2020m above sea level next to the Knoll Ridge Chalet. The bottom storey of the drive station is now well underway. This will be where all 50 gondola cabins will be stored overnight. Towers 4 is up! Towers 5 & 6 in progress. Components for the towers were transported to foundation locations last week using the material ropeway. Tower 4 is now complete and tower 5 and 6 nearing completion. Lack of access over the unique volcanic terrain for the Sky Waka gondola build is one of the complexities of the project. Even transporting concrete from the truck to the construction site has required some out of the box thinking! This Swiss engineered ropeway can transport up to 5 tonnes of equipment and materials without relying on helicopter use, which can be restricted due to weather conditions. At over 1000m in length with towers up to 34m tall, it is the first of its kind in NZ to be constructed for the purpose of building a passenger ropeway on a ski field. Large gondola components including tower cross heads and towers have been transported up the hill via the material ropeway over the last two weeks. Tower 5 is in the process of being erected making for exciting visual progress! The challenges of working in an UNESCO World Heritage alpine environment high on a mountain are all being taken in the stride of the Leitner Ropeways team constructing the new Mt Ruapehu gondola. Work is well underway on Sky Waka, the new highspeed gondola, with the team facing everchanging logistical challenges with engineering specifications, getting materials on-site, and the physical construction process. The $25 million gondola will be the largest and most technically advanced in New Zealand travelling 1.8 km’s through one of the North Island’s most rugged and spectacular landscapes past waterfalls and snow-laden peaks. Read more in full release.